One of my favorite summer amusements is to lay out on a blanket with my kids under a nighttime sky with a powerful flashlight. With the bright beam trained heavenward, I direct their attention to the sketchy patterns of the summertime constellations. 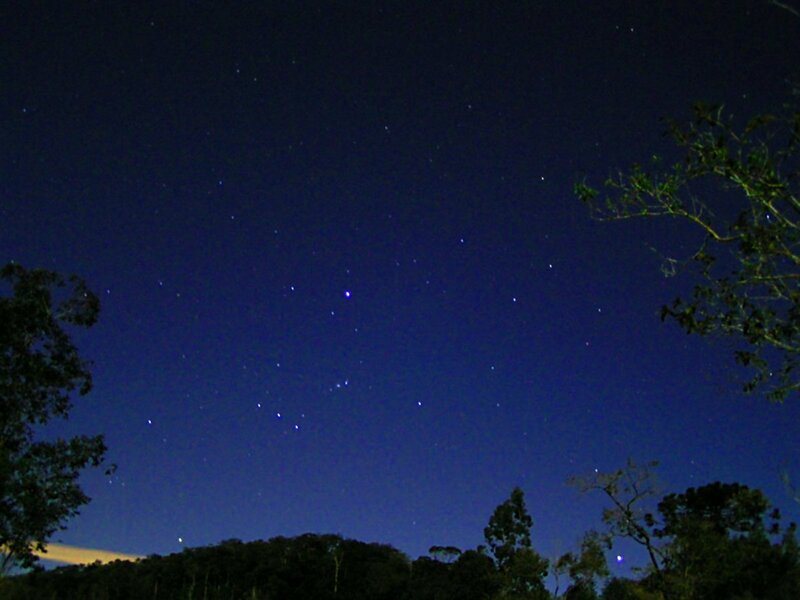 For amateur astronomers like me, “The Big Dipper” is the center of the universe. Once I locate that big, gaudy gravy spoon in the sky, I can begin to make sense of the little paint by numbers patterns around it. The drippy end of the ladle points toward the faint, but ever-present North Star that adorns the upside-down handle of the “Little Dipper.” Like a snake that has found its way into a kitchen drawer, the glittering tail of “The Dragon” curls between the Dippers major and minor. Nearby, Queen Cassiopeia’s chair rotates throughout the course of the summer, starting out as a lounger, and eventually moving to a proper, upright throne. The sum total of my astral knowledge includes Scorpio, Orion’s belt, and some constellations my brother and I made up. These creations of our imagination include, “The Shopping Cart,” “The Onion Ring,” “The Arrow,” “The Camel,” and a couple of others not suitable for printing. I have found that the natural human tendency to name things is something of a two edged sword. Naming things has a way of focusing one’s attention. For example, knowing a few official and unofficial celestial patterns tends to make kids pay more attention to a summer’s sky. That’s a good thing. But on the down side, knowing those few patterns can lead to the unintended consequence of being blind to everything else that isn’t included in one of these patterns—say like, the trillion or so other stars and planets all around them. The down side of naming things became clear to me when I attended the seminary for my home diocese. During the course of my liturgical studies, there came a period of time in which liturgy was no longer prayerful for me. Knowing the names and the proper procedures for the different parts of liturgies blinded me to the mystery that was unfolding before my expert(read pseudo-sophistocated) eyes. This is the temptation for those who share my profession of psychotherapy. Once a psychologist, social worker, or counselor is introduced to the Diagnostic Statistical Manualof the American Psychiatric Association, clients can start looking like diagnostic categories rather than people with unique personalities and histories. The truly skilled clinician must learn to bracket their professional knowledge. Knowing a few diagnostic categories is no substitute for the ability to stand in awe before someone whose life’s experience, personality, and soul is unique and unrepeatable. This Sunday, various churches will be contemplating the mystery of a trinitarian God. It seems to me that the feast of the Holy Trinity is placed into our liturgical calendar to put things into proper perspective. This feast stands as a vivid proclamation that there are some things that are beyond our ability to name. I believe that the feeling tone of this celebration is similar to the sense of awe that overtakes the casual celestial observant, who for the first time, sees beyond the superficial knowledge of the constellations and begins grappling with things like the origins of the universe. Thomas a’ Kempis, the great author of The Imitation of Christsaid that he would rather have personal experience of God than volumes of knowledge aboutGod. Perhaps a challenge you and I could take away from this Sunday’s celebration is an invitation to rekindle a healthy sense of childlike awe and wonder relative to this God-drenched world in which we live. In the spirit of this feast, perhaps we could take the time to bracket our expert knowledge and experience of one another and this world and set it aside for awhile. This week could you attempt to see your world afresh through the reverential eyes of a child?